MOPS, I’m More Than a Member. I’m Part of a Movement. If you haven’t guessed by now- I’m kind of over the membership thing. What was once a word that meant mutual (group) dedication to an idea, cause or purpose (People used to be members of actual groups they attended. Churches, non- profit organizations etc.) now, just feels like a marketing campaign on crack. I hold several memberships anyway. Some- I know are about marketing. I know they are to get me into the store so I spend more. (I should just have our income- auto deposited to certain places where I am a “Member.” I’m looking at you: Barnes and Noble, and Sam’s Club.I love you. But I know what you’re doing. justsayin.) And then.. there are other memberships. Like my MOPS International Membership. On one hand- it does have it’s privileges. There is a great website with members only deals and content that inspires and connects. There are inspirational mom-e-mails that turn up in my inbox uncannily at the exact moment when I most need to hear their honestly written words. There is a beautiful magazine- MomSense that I adore. And have even been published in. There is MOPS swag- who doesn’t love beautifully branded swag? I admit it: I do. However, I’m not a member of MOPS International because of the swag. I’m not a member of MOPS International because of the marketing. The Magazine subscription or it’s other privileges… I’m a member for old school reasons. I’m a member because I have MOPS sisters who believe the same things in countries all over the world. Russia. New Zealand. Australia. England. Guatemala. China. Meeting on military bases all over the world, in Starbucks, in churches in living rooms and rented spaces. My membership isn’t [just] about ME. Honestly? I could care less about the wonderful swag. Swag is available everywhere. In truth- MOPS membership doesn’t come in a box. It comes in your heart. Membership may have it’s privileges- but MOPS Membership is so much more than privilege. It’s an investment in reaching out to other mothers. It’s a statement that “I value mothering in word- and in deed.” In word- by calling my self MOPS mom and recognizing my sisters as MOPS moms- and in deed by investing my time, talents and treasure into a ministry focused on reaching every mother. That’s a lot of bang for a $23.95 price. The truth is—-MOPS Membership is about others. It’s about commitment. Membership is NOT a marketing campaign. Being a part of MOPS Membership is about being part of a movement. A movement of Mothers passionate about loving and helping each other. As messy and imperfectly and beautifully as we can. MOPS is a movement that stems from the very heart of God. MOPS flows out of His love and tenderness towards mothers. MOPS is something I’m honored and privileged to be a part of. And something I hope you’ll join me in. Dear Lord, I love you, and I love the women you’ve called me to reach out to through MOPS. Thank you- not only for the privileges I receive from that membership, but also for the privilege of being involved in this ministry and movement. Help me to get over my issues with membership feeling like a marketing campaign…. and help me and all members to see it as a way to invest and give to further reach out to those who have young. Help me to gently and lovingly lead. Thank you for an organization of people devoted to loving and helping mothers of all kinds. I love you Lord- amen. So— if you’re a reader- I’d love to know- What are you a member of? MOPS? Some other group? Tell me! In the Detritus of Winter- are the Seeds of Spring. Praying for Sandyhook. In the detritus of loss, are the seeds of hope. 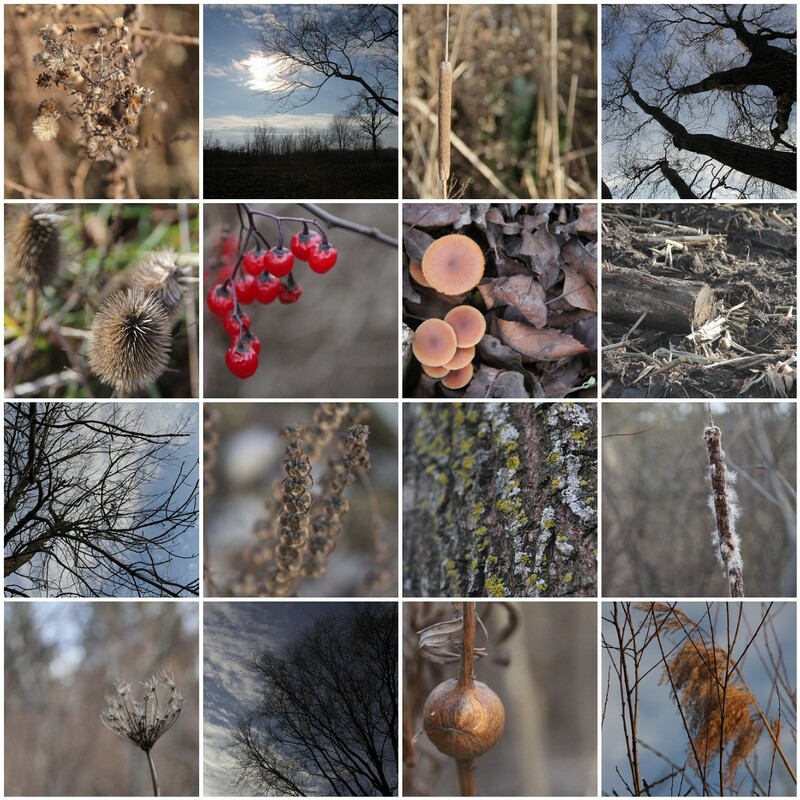 I grabbed my camera, and took a walk, desperate to find beauty. I had to look beyond the gray, overcast skies and mud to find it. I found it in unexpected places. I found it in places that [at first glance] looked barren. I looked closer. I found the beauty of life to come. In fuzzy, prickly burrs that hitchhike to better ground. I found it in stubborn lichen and moss that refuses to give up it’s hold on life. I found it in evergreens that defy the season of cold. In the detritus of winter- I found beauty in the hope of spring. It’s always there. Even in the darkest times. The worst days. Like moss, and evergreens, like seeds, pods and burrs.. if we look close enough. Today- I’ll be joining Moms all over the world- as we pray that those suffering in the aftermath of the Sandy Hook Elementary School Shooting can find hope. we’ll pray that they find comfort for their pain. That they feel love, in a time of loss. In a world that has been feeing dark- cold and lonely- there is beauty in the connection of mothers’ hearts reaching out to pray for each other. There is beauty in community. There is beauty and something holy in shared suffering. I wish I could change what happened… I can’t. But I can do something….I can pray. I can pray for mothers whose children who are troubled. I can pray for mothers struggling with fear as they send little ones off to school. I may not be able to change a mom’s circumstances- but I can make sure she’s not alone. If you’re feeling afraid, alone, overwhelmed or are longing to do something to support those who suffered such loss -I hope you’ll join with us in prayer. It’s a step in making the world a more beautiful, peaceful and loving place. One Dandelion is a Weed, a Field of Dandelions is Beautiful. The Great Dandelion Drama, begins early each Spring. It starts with the arrival of a single, leafy, sunny faced, little visitor. A visitor who is quickly plucked by the root, from it’s new home in our suburban lawn. So the battle begins. We do not allow dandelions in the suburbs. They are a sign of imperfection., a blight, a weed. What may be a harbinger of Spring and wildflower of the summer to some, is here considered a lawn cancer. Upon their arrival, they are assaulted with a chemo-like cocktail of chemicals. 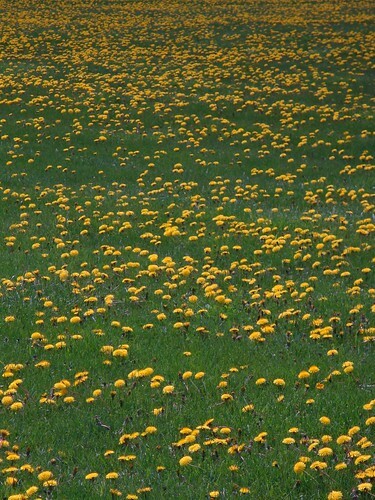 Dandelions are as contagious and dangerous as the Swine flu, if lawn masks were available, every lawn would wear one. Totally oblivious to the angst they create, those smiling yellow faces, peer out from between the deep green blades of grass. Like a solicitor at dinner time, they have no idea how un-welcome they are. The dandelions are simply doing what God designed, they are living and growing and filling their space with brilliant yellow blooms. While driving the other day, I experienced what happens when Dandelions are left un plucked and un tamed. I gasped at the beauty of a field aglow in yellow. It was breathtaking. What I daily saw as a weed, had been instantly transformed into beauty. I smiled. I stopped the car. I stepped out into the soggy field and took picture after picture, trying to capture the depth of the beauty that I saw. One dandelion is a weed, but a field of dandelions is beautiful. Sometimes, I feel like a dandelion. I am out of place. I don’t belong. I am messy. I am known for being late. My house is messy. I talk too loud and too fast. In a church culture that often values the quiet, background kind of woman, I am an upfront, speaking and sharing, kind of girl. I have imperfect kids and an imperfect marriage. I have a temper. My roots show white in the middle of my deep auburn hair. I can never get my face totally cleared up, there is always one pimple somewhere, mocking me. I joke that the National Weather Service should send out a warning to local counties when my hormonal storms arise. (I joke- but am convinced that lives could be saved if they actually did issue warnings.) I am prone to depression and anxiety. I eat too much and drink too much caffeine. I struggle, both with pride and with feeling insecure. I am afraid to try things, because I’m afraid I’ll fail. In short- if the world were a manicured suburban lawn, I’d be a dandelion. Looking at that field, I thought of all the women I’ve known and how they’ve shared their own dandelion feelings. Each one, imperfect, messy and fallible. I thought about how each one has also, taken her place in the field, being and doing the things that God has created her to do..I smiled. Together-I know we are just as beautiful as a field of dandelions, to Him. Dear Lord- help me to take my place in the field, help me to see the beauty in each woman around me, and to stop judging based on the perfection of her “lawn.” help me to encourage her with the beauty you’ve created in her imperfection. God- when I feel like a dandelion, I pray that you’ll remind me how beautiful dandelions can be- together,each one taking her place to fill a field. I love you lord- amen. I teetered on the edge of the flooded, scum topped, drainage ditch. I stretched to reach the half full sport water bottle that was floating on it’s surface. As I teetered, I heard my college boy mumble something about “nematodes” and wondered if maybe this was a bad idea after all. I didn’t want to have to explain the nematodes under my nails to the nail tech, the scum stains would be bad enough. “Can’t you get cholera from dirty water?” I heard the high school boy ask. Ignoring him, I sighed, and stood up with my slimey, nematode and scum covered prize. I dropped it into the half full garbage bag. “Scaring me won’t work guys- we’re filling these bags. ” I said in reply. It was Earthday and we were doing our part, or ELSE. They must have gotten the message, because they bent to pick up a broken cooler and an empty vodka bottle from the weeds. “Mommy! Look! I found garbage! I made a difference!” Yelled my youngest, as he added a broken hub-cap to the garbage bag. At least someone was enjoying this project. He was living on the edge- (this was the closer to the road than he is normally allowed) and doing his part to care for our community. He could not have been happier. I on the other hand, was starting to feel overwhelmed and disgusted. Everywhere I looked- there was more garbage, much of it not even within reach. It would still be there when we left. To be honest- it would be hard to tell we’d ever been there, at all. I felt a knot of tension tighten between my shoulders. This was NOT what I’d had in mind. “Why, exactly, do we have to clean up this mess, anyways? We didn’t MAKE it.” I heard mumbled from one teenager to another. I ignored them. But, I have to admit- although it had been my idea to do this, I was starting to wonder the same thing. I walked across the road and bent to the edge of the ditch on the other side. I reached out to pluck a soggy (but thankfully, empty) cup from it’s equally murky, depths. I felt my foot slide on the muddy bank. I tottered in slow motion and (thankfully) fell backwards onto my backside. I had no desire to slurp nematode soup. As I sat, mud soaking into my sweats, I caught my reflection in the scum topped and oil-slicked, ditch water. I looked awful. Not just dirty- but furious. I was furious that this was making very little difference, and furious that the older boys attitudes were crummy. (Not to mention my own.) I struggled to stand up without touching anything and I wondered how people do this everyday, for a living. “They get paid, to.” Was the answer that came to mind. “I don’t.” said a small quiet voice, the one I recognize in my heart as either the voice of God or truth… For a moment, I though I’d lost it. Maybe it was contaminated ditch water fumes, or the nematodes, but I argued with the quiet voice: “I don’t recall a bible story about you picking up trash on Earthday.” I snarked. “I do it everyday, it’s called grace.” The voice countered.